Over the past week or so the World’s press have been focusing heavily on the recently announced 9th July Tyson Fury-Wladimir Klitschko WBO-WBA-IBO Unified Heavyweight Championships rematch. Quite rightly so, it’s a huge fight, however just one week earlier, an equally World significant unification bout is also set to take place right here in the United Kingdom. On July 2nd, at the Arena UK in Grantham, Lincolnshire, World #15 and British #1 ranked Marianne Marston will not only be challenging South Africa’s World Boxing Federation (WBFed) Super Bantamweight World Champion Gabisile Tshabalala for her coveted crown, but will also be aiming to secure the World Boxing Union (WBU), Women’s International Boxing Association (WIBA) and Universal Boxing Organization (UBO) World accolades. London based Marston, who was originally due to challenge Unathi Myekeni for the Bantamweight version of the WBFed strap back in December, that was until Myekeni was forced to withdraw following a hand injury, is clearly relishing the belated opportunity, as she made clear when she spoke earlier. “I cannot thank WBFed President Howard Goldberg enough for making this happen, like me he was so disappointed when Unathi (Myekeni) pulled out injured last year. In addition to Howard, I would also like to thank WIBA President Ryan Wissow, WBU President Don Lewis and Sebastien Pitois from the UBO, as they have been so supportive throughout my career, so to also challenge for their Championships really is so special for me. I’m forty two now, so honestly thought after Unathi pulled out, that’s it for me, I’ll never get the chance to fight for a World title, OK that’s not quite true, I could have fought for a vacant title, but to me that’s just not good enough, I want to fight the best, I want to beat the World Champion. I’ve seen video of Gabisile, when she fought Shannon (O’Connell) in 2013, but would very much like to find any video of her when she won the World title last year. I know how much I have changed, fight wise, since 2013 so really want to see if there are any changes to her style or tactics. From what I have seen, she’s a classy fighter, very quick hands. When she fought Shannon, she was mainly counter punching, which would suit me, but for some reason I have a feeling she will have a very different approach as a defending Champion. Either way, this will be a great fight for the fans, there’s such a contrast in our styles and in my view it’s those differences in style and tactical approach that will make this such a great fight to watch. British boxing is booming, we have so many World Champions at the moment, Tyson Fury, Anthony Joshua, Kell Brook, Carl Frampton, Lee Selby, Liam Smith, Jamie McDonnell, Lee Haskins, Tony Moran, Craig Docherty, Terry Flanagan, Anthony Crolla, James DeGale and of course my old gym mate at the TKO, Billy Joe Saunders. Gabisile Tshabalala Vs Marianne Marston for the WBFed, WBU, WIBA and UBO Super Bantamweight Unified World Championship headlines the Russ Brown promoted AS GOOD AS IT GETS event at the Arena UK in Grantham, Lincolnshire, UK on Saturday 2nd July. Mdantsane, South Africa’s Unathi Myekeni has been forced to withdraw from the World Bantamweight WBU, WBFed, WIBA & WIBC World Championship Unification contest, against London, England’s Marianne Marston, which was due to take place at York Hall in London, on Sunday 6th December. Mr. Goldberg also proposed a possible replacement, reigning FECOMBOX Mexican National Champion Jessica Arreguin Munoz, from Agua Prieta, Mexico, whose record stands at nine wins and just the single loss. Shortly after hearing the news Marston spoke briefly on the situation and the possibility of boxing Munoz. “My first thoughts were, oh no here we go again. I can’t believe it I think I’ve only ever had one fight when I fought the girl we had originally planned, my last fight has to be the worse though, nine pullouts before finally fighting Jekaterina Lecko on the night. I feel sorry for Unathi, but can’t deny I am also very disappointed as now we have to have a new opponent. We had everything sorted for the camp based on Unathi and her fight style, but now we may need to rethink the sparring partners, especially if it is Jessica Munoz I’ll be fighting as she’s a southpaw like myself. I already know about Jessica, I’d seen her title fight against Lesly Morales, she’s a typical Mexican fighter, as tough as they come and likes to stand right there in front of you and have a proper slugfest. Have to say if it is Jessica the British fans will be on the feet from start to finish as it will be an all out and very bloody war and that suits me just fine, as when I was being trained by Joe (late, great Heavyweight World Champion Smokin’ Joe Frazier) and Marvis (Marvis Frazier) in Philly, that’s the way they taught me to fight. My style may have changed considerably since I’ve been back in England, but believe me I am still more than happy and more importantly more than capable to have a good old fashioned toe-to-toe slugfest when needs be, believe me I don’t care I’ll do whatever I need to do to win those titles. Now we have to see if Ryan (WIBA President Ryan Wissow) and Don (WBU & WIBC President Don Lewis) will accept Jessica as the replacement for Unathi, otherwise it’s back to the drawing board. Marianne Marston, against a yet to be named opponent for the unified WBU, WBFed, WIBA and WIBC World Bantamweight Championships co-headline the Mark Lyons and Marianne Marston co-promoted LET BATTLE COMMENCE event at York Hall, Bethnal Green, London on Sunday 6th December 2015. Please show your support and follow Marianne Marston on Twitter @MarianneMarston or on Facebook as well as the Let Battle Commence event on Twitter @LondonBattle or on Facebook. Posted in News | Comments Off on BREAKING NEWS: Myekeni Withdraws From World Unification Battle With Marston Due to Injury. London, England’s Marianne Marston is set for the toughest fight of her career to date, when she squares off against Mdantsane, South Africa’s Unathi Myekeni in a World Bantamweight Unification contest, at York Hall in London, on Sunday 6th December. British #1, Marston was hoping to challenge interim WBC Bantamweight Champion Christina Mc Mahon for her title this October, however Mc Mahon was offered the opportunity to challenge Alicia Ashley for the WBC Super Bantamweight crown in New York on the 29th October, a golden opportunity the talented Irishwoman just couldn’t turn down. With no championship bout on the immediate horizon Marston had decided to take on a non-championship bout at York Hall on October 23rd, then earlier this month she was offered the opportunity to challenge Myekeni in South Africa early in 2016, by World Boxing Federation President Howard Goldberg. Some slick negotiations by Marston’s team and London promoter Mark Lyons, along with support from her sponsors Monarch Communications, BoxFit UK, Optimax and 3X Sports, the contest was bought forward to December and moved to London. 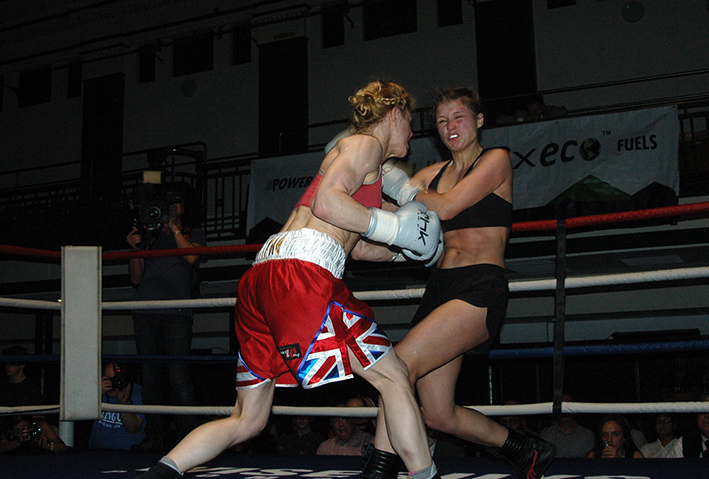 Marston, who secured the MBC International title, as well as the World #24 ranking, in October last year with a shut out points win over Marianna Gulyas, to line her up for the shot at a World title, however since that win Marston has only fought the once, beating Riga, Latvia’s Jekaterina Lecko by second round stoppage back in August. Her opponent on the 6th December, Unathi Myekeni, is far more experienced, both competition wise, as well as Championship wise, and has previously held both the World Boxing Federation and World Boxing Foundation International titles as well as the World Boxing Federation Super Bantamweight World Crown. In her last contest, Myekeni fought and lost by majority decision to fellow South African Gabisile Tshabalala for the WBFed Super Bantamweight title. “I cannot begin to express how pleased I am to still get to fight for a World title this year and the fact it will be a unification of four titles makes it even more special. When Christina told us she has the opportunity to fight in America for the WBC full title and as such our fight wouldn’t go ahead this year, I was really disappointed. Don’t get me wrong I’m pleased for Christina, but from day one of the discussions with her management we had been preparing for that fight, everything we had been working on was to fight her, we even tried to get an opponent that was similar in style to her for the August fight, but so it goes. Unfortunately I haven’t seen any of Unathi’s fights so don’t know too much about her, hopefully we’ll have some video of her title fights this week and then we can start looking for suitable sparring partners and really get the camp started. I can’t thank Howard (Goldberg) enough for giving me this opportunity, as well as Ryan (WIBA President Ryan Wissow) and Don (WBU & WIBC President Don Lewis) for their allowing me to fight for their titles too, as well as Mark (Promoter Mark Lyons) and my wonderful sponsors Monarch Communications, Optimax, Boxfit UK and 3X Sports for them being right behind me and giving me the opportunity of participate in this historic unification bout, what’s more right here in London. 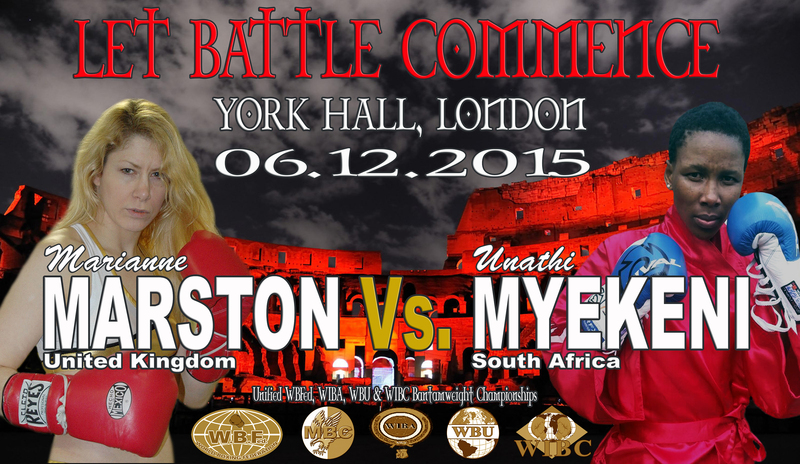 Marianne Marston vs Unathi Myekeni for the unified WBU, WBFed, WIBA and WIBC World Bantamweight Championships co-headline the Mark Lyons and Marianne Marston co-promoted LET BATTLE COMMENCE event at York Hall, Bethnal Green, London on Sunday 6th December 2015.